In April of this year, a friend of mine was going through some medical treatments in the hospital. She asked me to make her a quilt to keep her warm, because the hospital often ran out of blankets and she usually had only a sheet to keep her warm. It broke my heart to hear that! 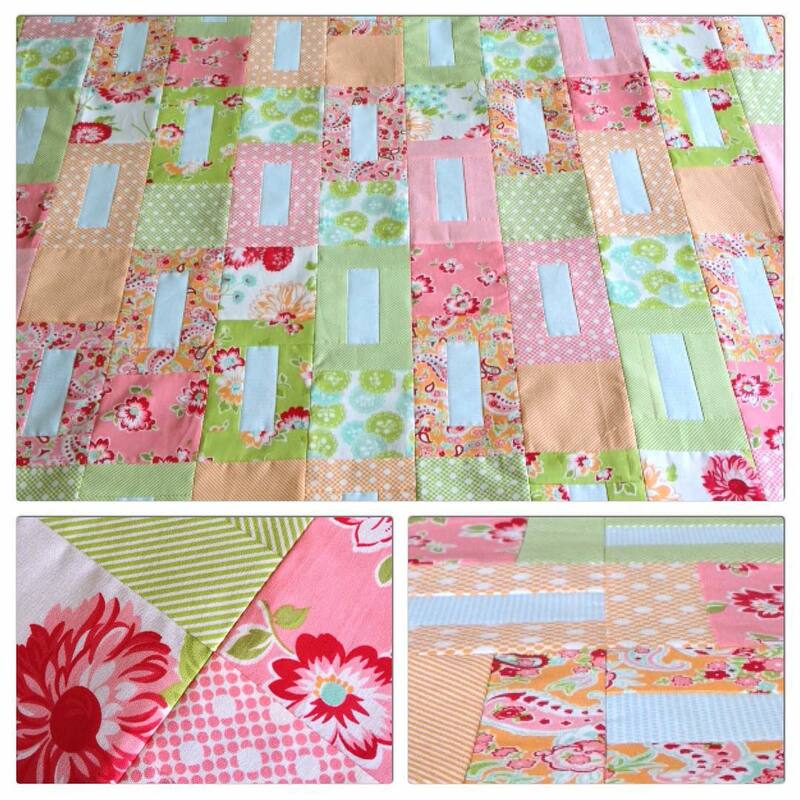 I wanted to make her a quilt very quickly so that she had something to comfort her during her treatment. I made this quilt in less than a week along with a tote bag to carry it back and forth to the hospital. I even used some soft and cozy minky on the back. She loved the quilt and I know that it still brings her comfort through her long and taxing treatments. 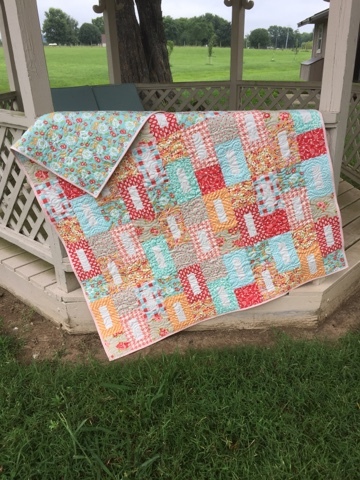 I call this quilt ‘Creamsicle’, because the orange fabric with cream colored centers reminds me of Creamsicle pops I loved as a kid. From this quilt, an idea sparked (along with a little nudge from a friend) to turn it into a pattern. I wasn’t in the mind set of pattern drafting while I was making this quilt, so it was more difficult than I realized trying to work backward and figure out the cutting instructions. I typed up the pattern but got nervous about the next step, so I put it away for a few months. One night in July, I couldn’t sleep. It’s been a dream for a long time to be a pattern and fabric designer. I kept wondering if I should pull out that pattern again. 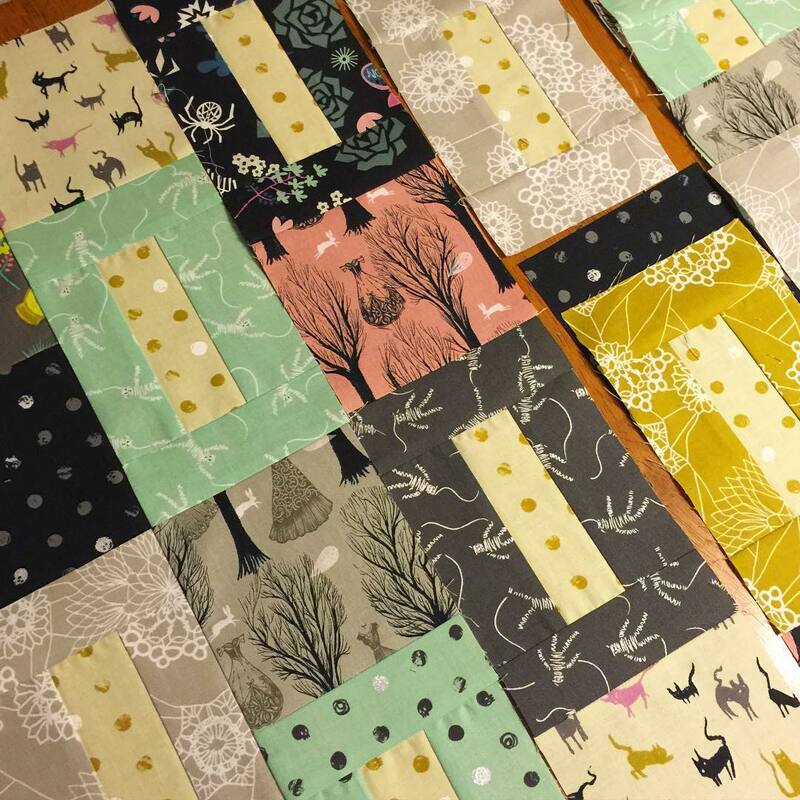 I woke up the next morning and decided to throw caution to the wind and put a call out for pattern testers. It’s a good thing I did it first thing in the morning, before the coffee had time to turn my brain on. It was a scary feeling, sending a pattern out for people to take a virtual red pen to. But my pattern testers were so awesome and so great to work with! They definitely made the whole process a lot less painful than I expected. First to finish the pattern was Vickey. I never expected to have the first quilt completed (quilted and bound too) in the first week. But Vickey was amazing and put her long-arm skills to work for a quick and beautiful finish. You can find Vickey on Instagram and her blog, where she shows off her beautiful long-arm work. Taunja finished her quilt top just as quickly in Bonnie and Camille’s beautiful Scrumptious fabric line, that I”m sure she has been hoarding for a long time. I’m so glad she was able to cut into it because look at the sweet quilt she made! Go check out Taunja’s Instagram account and blog where she shows off her beautiful quilts AND a great furniture makeover too! She combined an old dresser and dining table to make a cool cutting table for her sewing room. It really is awesome, you have to see it for yourself! 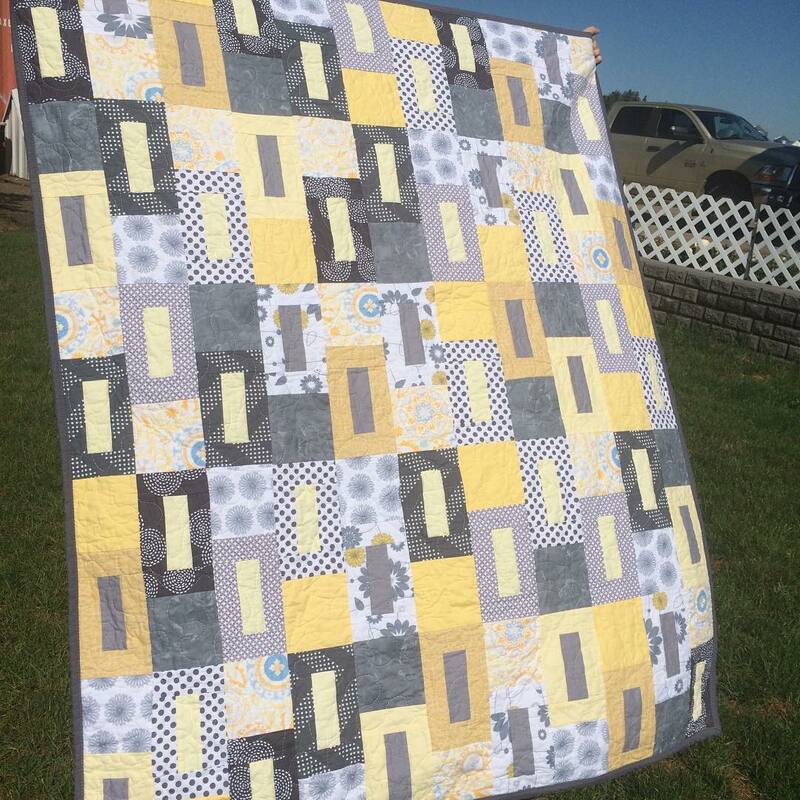 Conni finished her quilt with a soft palette of grays and yellows that is just so pretty! She finished hers with a cozy fireside backing that is going to be so nice to snuggle under as it starts to get cooler. 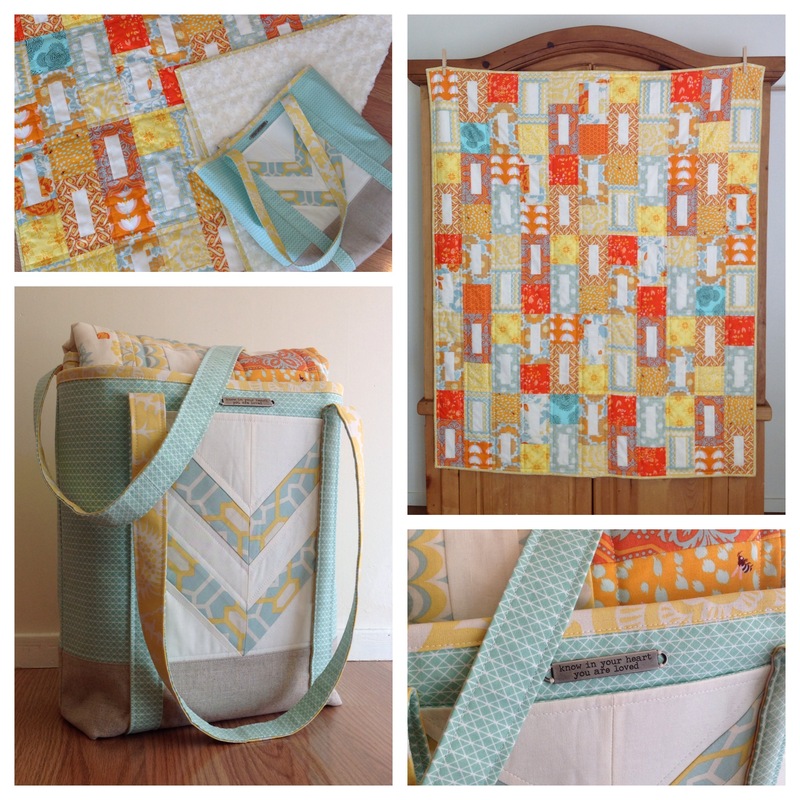 Conni’s Instagram account is full of her beautiful quilts and bags. She’s been making over her sewing space and that in itself is eye-candy! 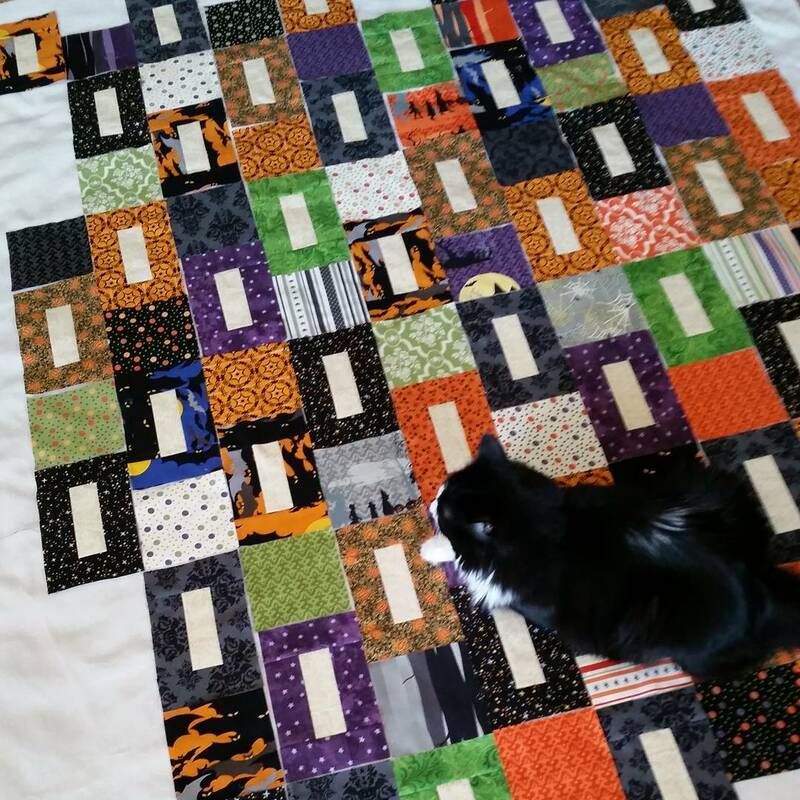 *Sigh* I can’t wait to have my own sewing space like hers…..
Tyler made her quilt in Sweetwater’s Lucy’s Crab Shack, another line that I know she had to be hoarding for awhile! This quilt is so much fun! It made me wish I still had some Lucy’s Crab Shack fabric left. 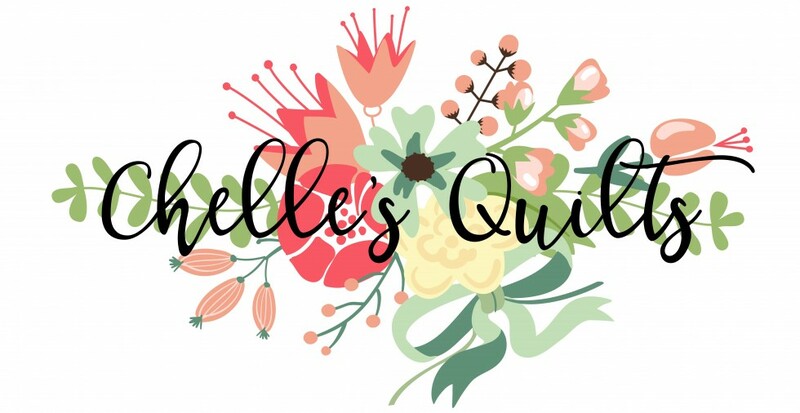 Tyler sells her quilts too! You should check out her Instagram account where she posts the quilts she sells and her other pretty creations. 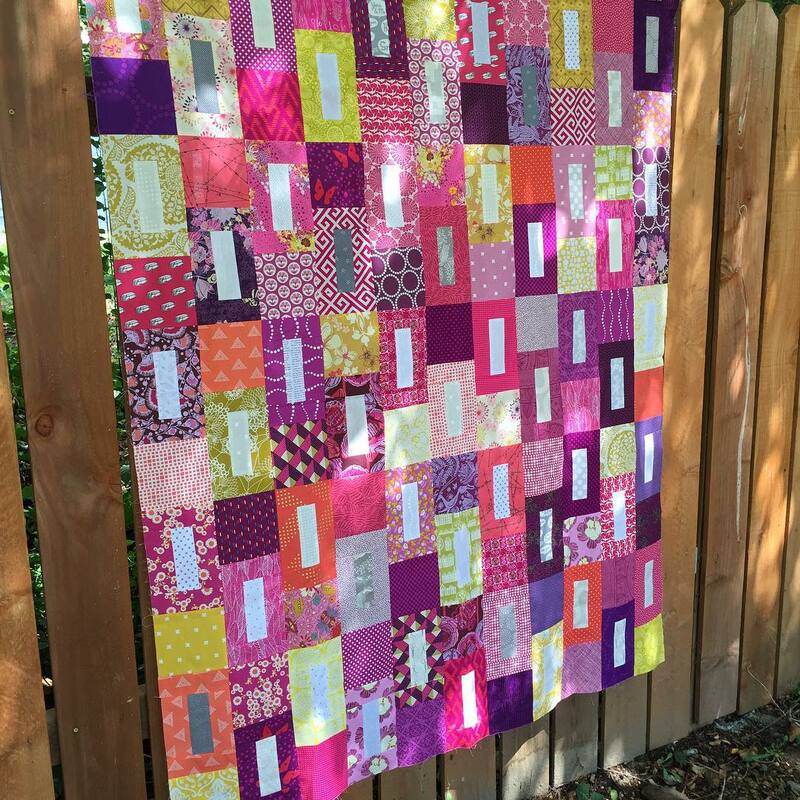 Kim made her quilt in Dashwood Studio’s Cuckoos Calling and it is stunning! I really love the colors in this line and now I need to go buy and hoard this fabric while I can! Those little cuckoo clocks are adorable! I love how Kim kept the square blocks uniform with the cuckoo print. Kim also makes some adorable pin bowls, needles minders and donut pins, which are all to die for! You really should head over to her Instagram account. Serious eye candy! Kate made her quilt from some awesome Halloween scraps. She even has the black cat to match! She’s making her quilt even bigger than the pattern and I can’t wait to see how it turns out! 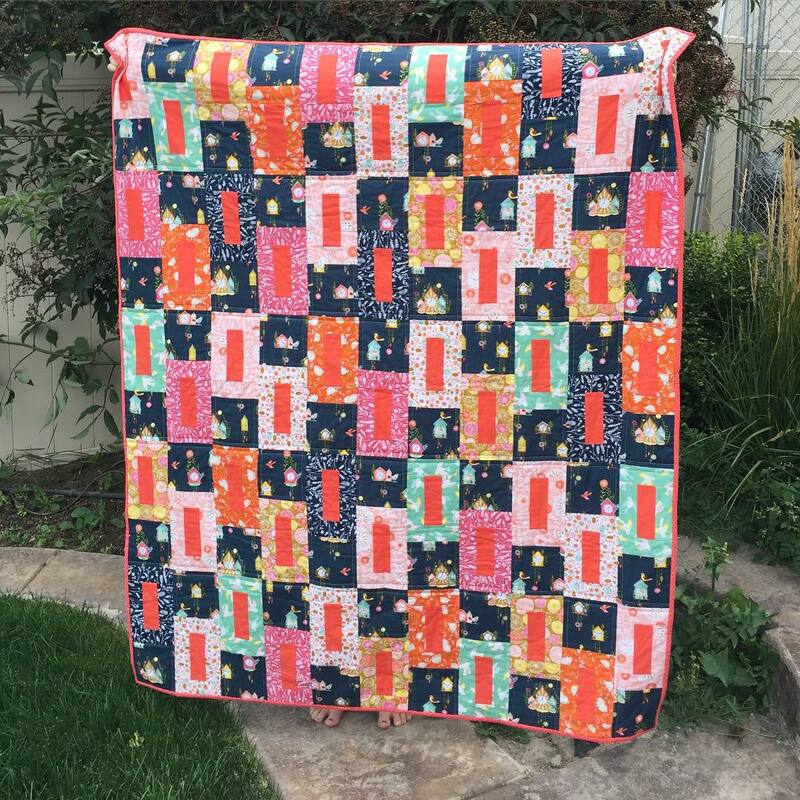 Kate makes some killer tee shirt quilts and tons of other beautiful custom quilt and blogs about them here. She runs half marathons too! I don’t know how she gets so much done. She may have a magic wand or a pact with the devil. Whatever it is, I need her energy! My friend, Rhiannon, also offered to test my pattern and I’m so glad she did! I have grown close to a handful of women on Instagram and she is one of them. I am so thankful to have her input and support! Rhi went scrappy with her quilt and I just LOVE her eye for color! 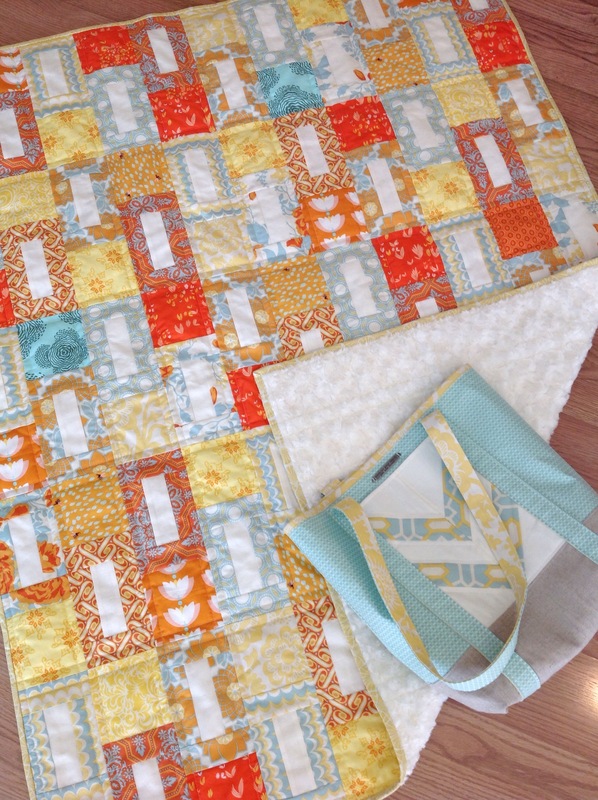 I love a good scrappy quilt and have a serious crush on hers! She is the queen of scrappy bags too! I just love everything she makes! You can find Rhi’s beautiful creations on her Instagram account. Last but certainly not least was another friend of mine, Michelle. She made her quilt out of Cotton and Steel’s Spellbound and WOW! Another fabric line I’m going to have to buy and hoard before it’s gone. Michelle has been one of my biggest cheerleaders and helped to push me out of my comfort zone and to create this pattern. I am so grateful to have friends who believe in me! She is the other queen of bags (yes there are two in my world) and everything that comes out of her studio is gorgeous! You can find her on Instagram where she posts about her many crafting adventures. She promises to teach me how to crochet someday and I. Can’t. Wait! You can find my downloadable quilt pattern in my new Craftsy Pattern Shop. To celebrate it’s release, I’m listing it for 25% off this weekend only (through Sunday August 9th)! Once again, thank you to all of my pattern testers! You’ve made this a really fun journey! Congratulations to you and best wishes! I kind of giggled when I read that you were nervous to send out your IG call for pattern testers, because I was nervous even volunteering to be one. But we all need to take those scary steps sometimes. Your pattern is terrific. I’m so glad I was even a little part of your process. Keep it going! This is a great design & you have a warm heart. Your friend will be very comfy under her quilt at the treatment center!! 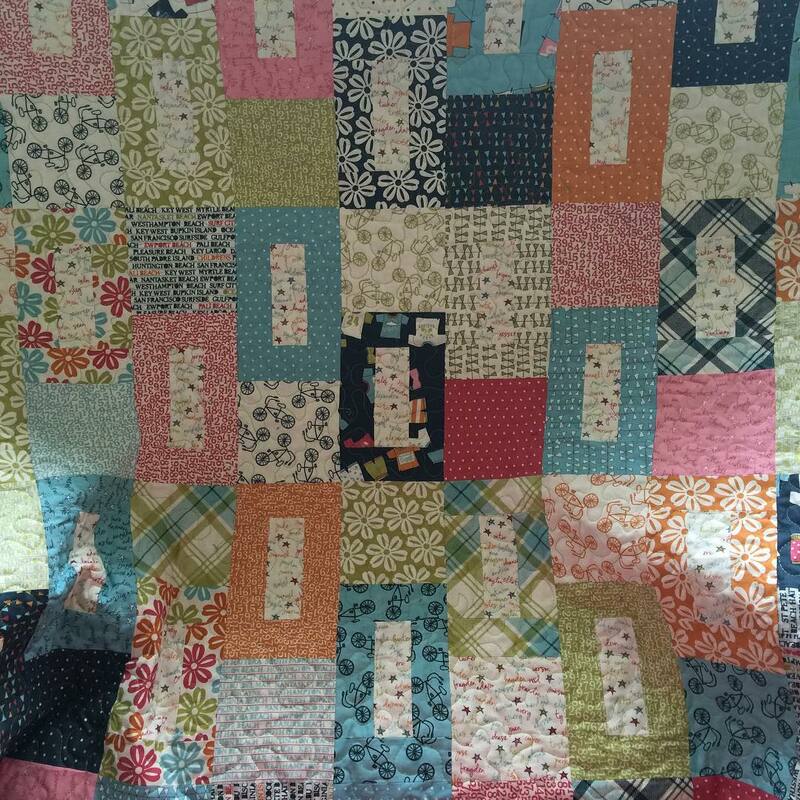 If I had had this quilt at the beginning of my breast cancer treatment I would have had all of my care givers sign the small white rectangles.